Please feel free to look around the website, because I've tucked away all sorts of fun and helpful things. For example, I know what a pain it is to contact each and every designer you research for a quote—so, I nixed that. 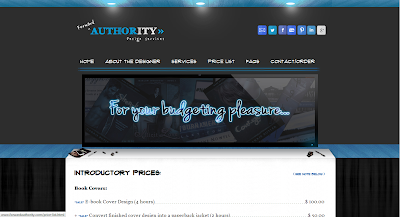 Forward Authority has a loose price list to help you budget, and it's broken down by hours. That way, regardless of your budget, you know there's a way to make your project happen. You could get an e-book cover (4 hours) for $100. You could get a digital art piece depicting one of your book characters (3+ hours) for $100. A basic brand logo (2 hours), a matching FB cover photo (1 hour), a blog button (30 minutes), and a 3D render (5 minutes) of your book for $100. Congratulations, Carrie! You are really talented. Hope you get lots of clients. This is awesome. As a new free agent, this is timely to boot. Best of luck to you, Carrie--I'm sure you'll be quite successful! Carrie, I'm so excited for you and your new design service! I've loved your designs since I first discovered Strength, and your awesome website! Such a great idea and perfect for you. Good luck! Best of luck, Carrie! I'm looking into the business side of self-publishing and there's a lot involved on top of simply doing what you love to do. It's a daunting prospect. Congrats on making the leap. Congrats Carrie and best of luck in this new venture. Also thanks for the giveaway. Thank you for the kind words, Clare! *hugs* I can't wait! $75 or not, you're working on my next cover! Congratulations, Carrie! Your graphic design is awesome! Congratulations! Such an exciting time for you and a great opportunity for authors. Congrats on your new venture, Carrie! I think this is a great time to start this kind of business! Congratulations on your new business! Maybe I'll be able to use some of the services in the near future. About time, eh? ;) Thank you, Melissa! I really hope so. :D Thanks, Kelly! That would be great! :) Thanks, Carrie-Anne! What a great idea to use your talent, gifts and passions. I think you will really succeed; there seems to be such a need in this area for someone talented and up front with costs. All success to you! I will most definitely keep this in mind, Carrie. I don't have anything at the moment, but hey--that could change. I think this is awesome and I'm sending it out to everyone I know. Best of luck. Ohhh. Count me in. I love your design work!!! Congrats on your new business!! May it be a huge success! Congratulations, Carrie!! I'll be in need of a new cover in a few months. Much success to your new business! Where's the newsletter sign up? I can't find it. Wow, wish I'd found you about three months ago! But, I'm following and I've bookmarked, just in case. BTW, what is a 3D render? Congratulations! Love new business ventures. You're very talented so I'm sure it will go well! Congrats! A digital art piece of a character sounds awesome! I'd probably get that. Thanks, Lisa! :) A 3D render is what a book cover would look like as a paperback. Congrats. Wishing you every success. You'll be on FFF this Friday :) So excited for you! Thank you, Joylene! :D You rock! That's wonderful!! You will be awesome! I wish I'd known sooner--we needed a logo designed. Next time! Very cool. I am bookmarking your site. I may be in need of cover art sooner than later. Here's hoping your site gets tons of hits! Very cool! I like fiddling around with my own covers and stuff (I refuse to spend anything on my republished works), but yours look very professional. Hi Carrie . It looks great. I I win, I might want a future book cover ! We are all in good company. Such talent everywhere!